Regina Cassandra On Koffee With DD in baby pink pleated saree designed by Bhaavya Bhatnagar, paired with pink embroidery designed blouse with quarter sleeves blouse. Ritu Baridar at "Petals Exhibition" in saree gown style draped golden color saree with printed designed pleats across the saree, paired with sleeveless netted golden blouse with shimmering patch works over it with round neck pattern. Actress Zarine Khan at Zluekha Shariff collection launch held at Nido in royal blue color gown model draping saree, paired with sleeveless blue color high neck patterned blouse with embroidery designs over the neck. 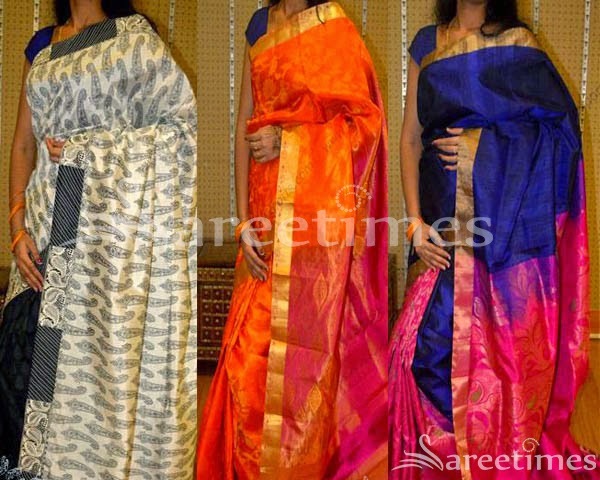 Latest designer silk sarees and draping saree collection designed by srihita exports . Bollywood celebrity and designer Shaina NC in beautiful pink designer saree drape. Gold embellished patch work all over saree. Silver crisscross thread work through out border,sequins butte work around it. Paired with pink designer short sleeves saree blouse with square neck pattern. Butte work across the border. Bollywood actress in beautiful orange designer plain saree drape. Contrast with gold designer halter neck saree blouse. Bollywood actress in beautiful green designer plain drape saree at Rehana Ghai’s Birthday Bash. Contrast with gold designer halter neck saree blouse. Celebrities Lakshmi Manch,Tabu,Anushka and Trisha attend Director K.Raghavendra Rao son Praksh Rao Wedding Reception. They looked beautiful in different styles. Bollywood actress in beautiful cream designer drape saree. Gold embellished patch work on it. Paired with designer shoulderless saree blouse for back. 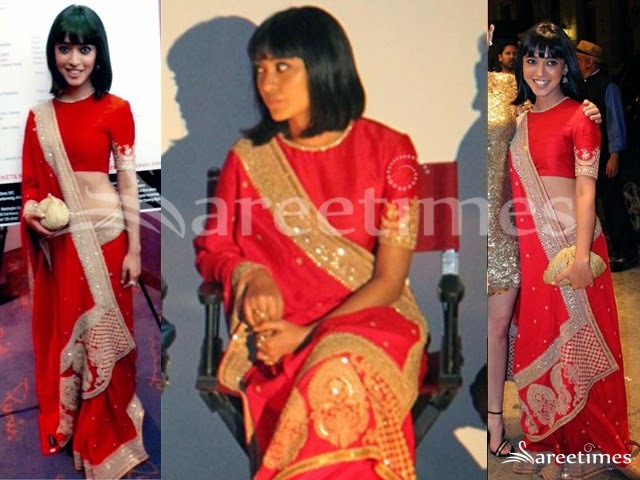 Bollywood celebrity and Designer Vaishali S saree collection. Model displaying beautiful red designer plain saree drape. Paired with designer embellished full sleeves saree blouse with round neck pattern. South Indian actress Avantika in beautiful yellow and blue designer half and half saree drape. Embellished applique patch,thread work across it border. Paired with designer short sleeves saree blouse. Model walks in beautiful white designer printed saree drape and black border. It is a silk fabric. Designed by Morarka at Day 3 LFW Summer/Resort 2014. Printed designs work on it. Paired with designer embellished 3/4th saree blouse. Embellished patch work highlighted on sleeves. Model displaying beautiful white designer plain saree drape. Designed by Manish Malhotra at Day 1 LFW Summer/Resort 2014. Paired with designer printed sleeveless saree blouse. Bollywood actress Divya Khosla Kumar in beautiful tan designer silk saree drape at Mirchi Music Awards 2014. It is a plain saree. Paired with designer sleeveless saree blouse.